This little Birney car was designed in 1915 to help keep trolley lines out of red ink. Designed as a one man operation, it saved salaries, It was a lot lighter cutting track maintenance as well. It had a number of new features such as special motors, controllers and brakes. The car also incorporated interlocking door switches which made it impossible to move the car before the doors were closed. Due to it’s small wheels it could accelerate and slow down quicker but the same features cut down on the top speed of the cars. 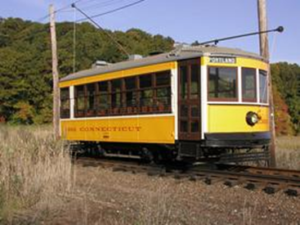 Car 2350 was built by the Osgood-Bradley car Company in 1922 and used in Middletown Ct. as part of the Hartford Division of the Connecticut Company, then moved to New Haven where it became a crew car. The car was not a pleasant ride, it had a tendency to “gallop” down the track, and its 16 wooden seats were not that comfortable. It has two Westinghouse 506A traction motors and a DH16 compressor. Both motors and the compressor had to be rebuilt due to Irene and then Sandy flooding. The project was funded 25% by the museum and 75% though our FEMA disaster assistance award.